As we all know the design of our parking lot is challenging at best. We really need your help in keeping students and others safe. 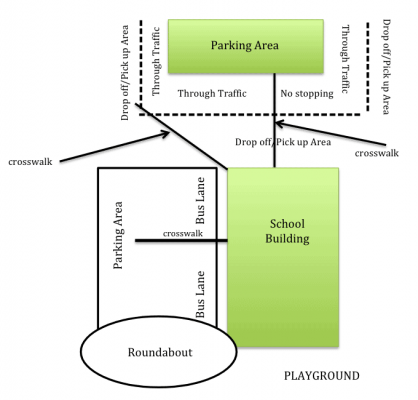 We ask that you watch for the adults trying to help students cross at the designated crosswalks. You must yield to those in the crosswalks. Please use the following guidelines as you drop off and pick up your students. Do not use the front of the school for dropping students off during bus times. Our buses arrive between 8:10‐8:20. The buses exit between 8:25‐8:35. These are all approximate times. Buses can be early or late. Please do not sue the roundabout or front area for dropping off during this time. There is not enough clearance space for the buses and cars in the same location. Student drop off and pick up is on the north end of the school. The right lane from the driveway entrance all the way around and up the hill is for drop off or pick up. Vehicles may stop in this lane to drop off or pick up students. You must fit against the curb and clear the bus lane to stop in the lane parallel to the school. The left lane is for through traffic only. Do not stop in this lane to drop off or pick up students. This is dangerous, as students have to walk between cars to arrive at your vehicle. IF there isn’t stopping space available in the right lane, you can park in the parking area and use the crosswalk to walk your child back to your car. Pedestrian crossings are marked. Please use them instead of walking between cars. This is very dangerous and we have already had a few near misses.